Live your outdoor dream today! 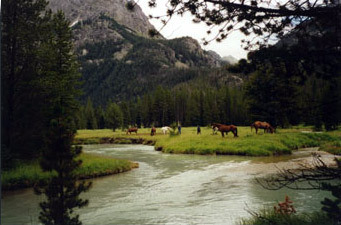 Leave the city life behind and head for the high mountain wilderness of Montana. Join us at the Royal Tine Camp Cook School, operated in conjunction with Royal Tine's Guide and Packer School in the backcountry wilderness of the Rocky Mountains. The reward of cooking in the refreshing mountain air, along with the aspiring Guide/Pack students mixes a career opportunity with friendship and fun. Here's a wonderful opportunity for anyone who wants a healthy, satisfying career in the outdoors or to just plain learn the art of Dutch Oven Cooking. Learn from the renown camp cook and dutch oven expert, LeRee Hensen, as featured on the July 2006 Food Network special. LeRee has been cooking and guiding for outfitters in Montana, Idaho and Alaska since 1990. She is an avid hunter and outdoor person plus a 4th generation Montanan, LeRee is extremely well respected and highly regarded by her peers in the outfitting industry. Students gathering her knowledge are in great demand! Cooking favorite, heirloom recipes and preparing wild game turn out delicious dishes using the bare essentials and a whole new set of cookware. Cook with Dutch ovens over wood heat and charcoal, incorporate sourdough recipes into menues or digging an earthen pit to bury a turkey -- these are only samples of our cooking school specialties. You'll learn to impress any client with hearty five-course meals. Camp accomodations include living quarter wall tents with a cook tent and outdoor cook site teaching facility, located on the family 10,000 acre cattle ranch in the foothills of the Anaconda-Pintlar Wilderness. A gravity feed shower tent facility is provided, but there is no electricity or running water. Classes run from 6 am to 7 pm six days per week. Monday is a day off to go to town for personal errands or just relax. The closest "big city" from camp is Philipsburg. It is 17 miles, population 900. 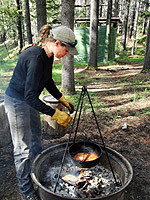 Backcountry cooking is a pathway to experiencing a lifetime of opportunities in the pristine wilds of the west. Sign up today to take advantage of our camp cook school with the high country pleasures in the Rocky Mountains. The Royal Tine Camp Cooking School is a learning, living experience -- one guaranteed you will never forget! Imagine! This can be your office!